The Global Game Jam is an annual event that sees game developers across the globe lock themselves up for 48 hours to work on a game. They’ve been going on since 2009 and arrived in my local city, Melbourne, in 2011. Over 150 developers gathered in Melbourne to make games this year, joining their fellows in over 480 locations worldwide. At the start of the event on 24th January, the developers split off into teams and started brainstorming ideas. They then set to work over the next two days to bring their ideas to life. At 3 PM on the 26th, everyone was told to stop jamming and upload all their games to the official Global Game Jam website so people could download and then play them. There were a total of 4200 games made worldwide. Each year, the developers are given a theme, the one this year being “We don’t see things as they are, we see them as we are.” Some pretty interesting games came out of it, and I’m going to be talking about a couple of my favourites. 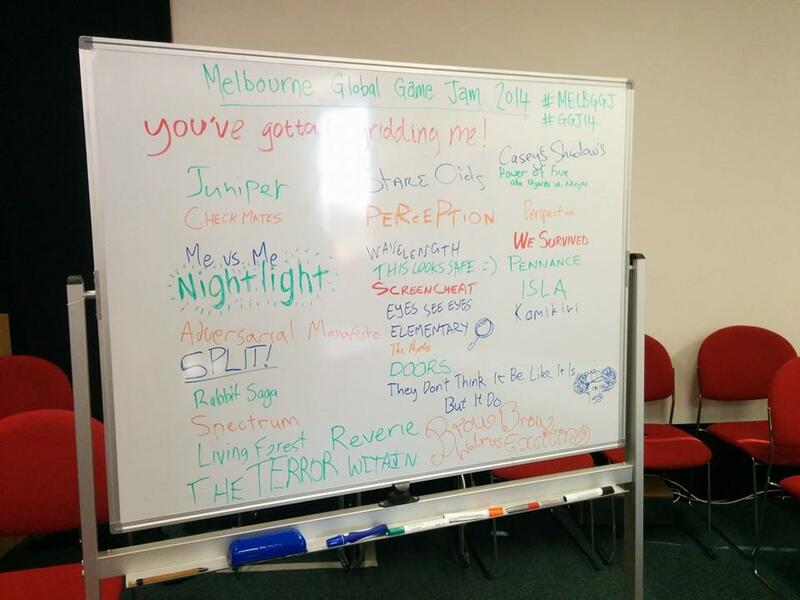 A photo of the whiteboard showing all the games being made this year, taken by event organiser Giselle Rosman. Isla was the game that stole the show for me. You start off as a humanoid creature who has just arrived on a small island. Your objective is simple: go to the farmhouse, grab your friend and return to the boat. However, your time would be better spent exploring the island, checking out the lighthouse at the top of the hill; there’s little to interact with, but it’s still gorgeous. You can also change your perspective to view the world through your buddy’s eyes while still controlling the first character. It looked like a really interesting game that I hope will get taken further. Ever wanted to play Dance Dance Revolution with your eyebrows? 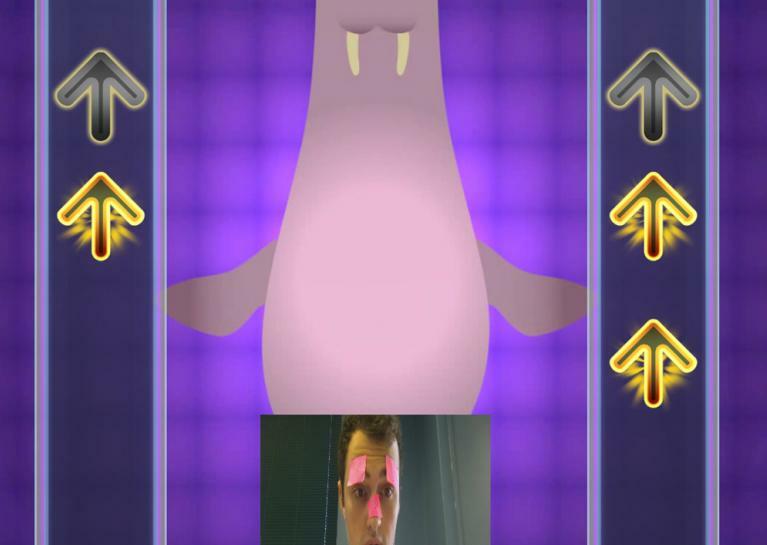 Now, with Brow Brow Party Walrus Exciting, you can! Simply switch on a webcam, affix a bright pink sticky note to your eyebrows, sit back and enjoy! I didn’t give the game a go at the jam, but I was watching some other people play it and loved the silliness. I’m going to give it a crack later this week after I get some pink sticky notes. Screen-Cheat was another game I had a lot of fun with. 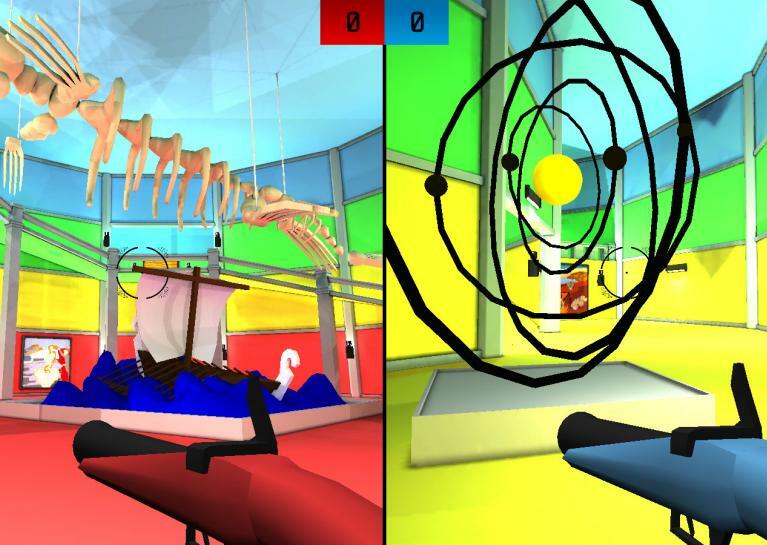 It’s a split-screen shooter that supports up to four players. All the players cannot see each other, so the only way to tell where everyone else is hanging out is to look at their screen. Each separate area of the game was a different colour, making it easy to tell where everyone was. It was a lot of fun to play. There were a lot of games I didn’t even get to see at the event, let alone play. 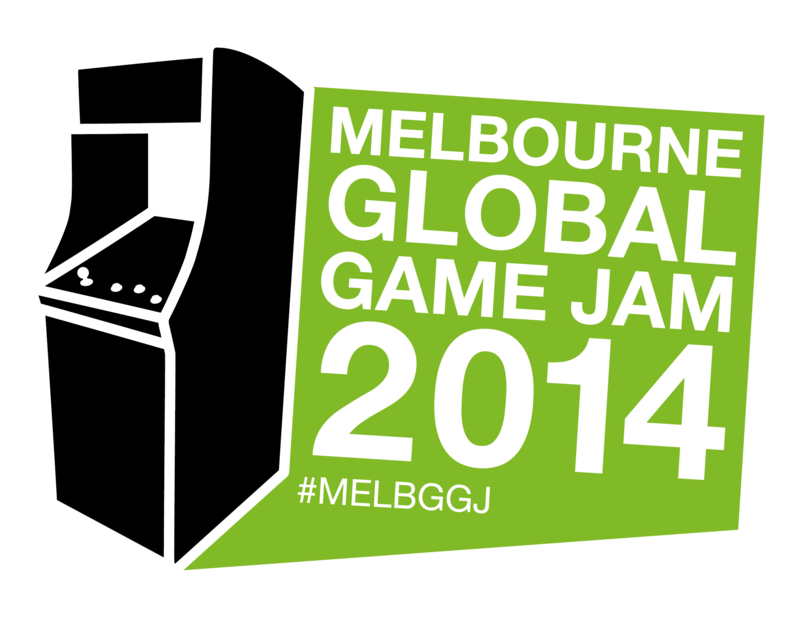 Make sure to drop by the Global Game Jam 2014 page for Melbourne to check out the rest. You can find the games made in other areas at this link—be sure to stop by and take a look! Games are classed based on what was used to make them, the hardware they’re compatible with and their content. You can also download and play each of the games made. It blew me away seeing what people could create in just two days. They may surprise you, as they did me. Be sure to keep an ear out later in the year for more details on next year’s jam. If you can, find out where your nearest one is and drop in, or maybe even participate. It’s a great place to go and see.